Do you have a bay window roof in need of repair? Maybe your existing roof is past it’s best and is leaking, or maybe your lead flashing has been stolen by thieves. Either way, Merlin can install a Fibreglass roof that will last for over 20 years and look every bit as good as your lead roof did. There are other materials that can be used for bay window roof replacement – bitumen is harder to seal round edges and fancy shapes, so is rubber. Both of these require some sort of flashing to seal the roof anyway, which is usually fibreglass. Also – neither of these materials look as good as lead, and sometimes it’s important to retain the traditional look of a building that only lead can give. Unlike lead roofing, fibreglass is not prone to cracking due to heat expansion and contraction at different rates. Neither does it have any resale value so it’s worthless to thieves. In fact Fibreglass is a very tough material and will improve the security of many buildings as thieves are unable to cut their way in through the roof. From an installation point of view it’s a good choice as it makes such a good job of sealing inaccessible areas or strange shapes. It also make the bay window roof a single structure, from where it meets the wall to the edges where it curls over, so there is absolutely no chance of leaks. So if you are looking for a bay window roof replacement then fibreglass is a great choice. 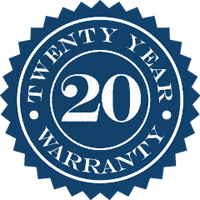 A fibreglass roof from Merlin is guaranteed for 20 years, but is expected to last much longer, so you can simply install and forget about it for years to come. Call us for a free no obligation quotation today.